WASHINGTON, Sept 26  Finance Minister Yashwant Sinha has urged the World Bank to withdraw the cut it had introduced in the lending programme for India in the wake of nuclear-related sanctions, affecting its funding to the countrys infrastructural projects, a pre-requisite to sustain the higher growth path. BEIJING, Sept 26  A fresh earthquake rocked Taiwan in the early hours today causing more deaths and destruction, just five days after a similar catastrophe struck the island killing over 2000, an official report said here. CAIRO, Sept 26  Egyptians went to the polls today in a largely ritualistic vote to confirm President Hosni Mubarak, the only candidate, in office for another six years. State television showed Mr Mubarak, his wife Suzanne and two sons Alaa and Gamal casting their ballot at a girls school near their home in the Cairo suburb of Misr El-Gedida. ISLAMABAD, Sept 26  Despite the earlier assertion that it would take a final decision about crossing the Line of Control next week, the Amanullah Khan-led Jammu and Kashmir Liberation Front has started mobilising support urging people in Pakistan-occupied Kashmir to take part in it. DUBAI, Sept 26  Yemeni President Abdullah Saleh was re-elected with a landslide victory in the first direct presidential election in the country. ISLAMABAD, Sept 26  Pakistani opposition leaders have rejected talks offer by Prime Minister Nawaz Sharif, terming it as a ploy to divide their alliance as well as to give his government a new lease of life in the wake of nationwide anti-government movement by their parties. ISLAMABAD, Sept 26  A Pakistan occupied Kashmir Urdu journal has claimed that Islamic militants are in a position to use poisonous gases and chemical weapons in Kashmir, thus strengthening the suspicion of the Indian Army that they have already tried them during the Kargil invasion. ISLAMABAD, Sept 26  Pakistani opposition leaders, led by former Primer Benazir Bhutto, today slammed the Nawaz Sharif government for another crackdown on a proposed opposition rally in Karachi terming it signs of panic while describing Sharif as a "petty tyrant". CAIRO, Sept 26  An Indian maid has been arrested here on charges of murdering her employer, local media reported today. GROZNY (Russia), Sept 26  Russian warplanes today bombed a southern area of the Chechen capital Grozny, where according to locals an oil refinery is located, an eyewitness said. BETHESDA (USA), Sept 26  Doctors have asked US President Bill Clinton to rest his voice for 10 days to ease chronic irritation of his vocal cords, following a physical examination that found him in excellent health despite gaining 8.1 kg. KABUL, Sept 26  Afghanistans opposition forces today conceded that the Taliban had made some advances after the hardline Islamic militia launched the second wave of its summer offensive. WASHINGTON, Sept 26 (UNI)  Finance Minister Yashwant Sinha has urged the World Bank to withdraw the cut it had introduced in the lending programme for India in the wake of nuclear-related sanctions, affecting its funding to the countrys infrastructural projects, a pre-requisite to sustain the higher growth path. Mr Sinha, after his meeting with World Bank President James Wolfensohn told, the Hindi service of the-Voice of America last night, that the impact of the reduction, as of now, had been marginal. Nevertheless, if it became an established policy and pursued down the line, it was bound to have an adverse impact. In reply to a question, he said he had discussed with Mr Wolfensohn the situation arising out of the sanctions that the USA and other countries had imposed on India after its nuclear tests in May, 1998. Through discussions, efforts were being made to see that the bank reconsidered the policy and restored the funding as early as possible. The World Bank sanctioned a loan of only $ 1.05 billion for India in its fiscal year 1999 which ended on June 30 last, as against $ 2.1 billion in the previous year. This time, it approved only seven projects while their number in 1998 was 11. According to reports, India had submitted projects, expecting about $ 3 billion as loans in the fiscal 1999 but it received only $ 1.05 billion. The shortfall was stated to be due to the lending agencys policy not to consider infrastructural projects in pursuance of the sanctions. Mr Sinha said India all along had very productive relationship with the World Bank and was keen on maintaining it. During his meeting with Mr Wolfensohn, views on the lending agencys developmental policy for the future were exchanged. The minister urged the World Bank chief to widen the scope of the definition of "human needs projects," which the group of eight(G-8) developed nations, led by the USA, had exempted from the sanctions. He said he had argued that the basic human needs included development of energy sources and road network. It did not appear reasonable to deny loans for such projects, placing these in the category of infrastructure sector at present barred from funding. Mr Sinha made out a strong case for widening the definition of "basic human needs" to provide funds for energy and other such infrastructural projects without which it was not possible to retain the higher growth path that the country had acquired after its 1991 economic reforms. According to informed sources, the bank chief was sympathetic to India, having publicly praised the progress it had made in developing its economy despite odds. A via media is expected to be found to approve infrastructural projects. Last year, the bank approved one such project in Andhra Pradesh. BEIJING, Sept 26 (PTI)  A fresh earthquake rocked Taiwan in the early hours today causing more deaths and destruction, just five days after a similar catastrophe struck the island killing over 2000, an official report said here. The earthquake measuring 6.8 on the Richter scale with its epicentre at 23.9 north latitude and 121.1 east longitude between Hualian and Nantou in Taiwan shook the area at 0752 hrs (0522 IST), Xinhua news agency, quoting Chinas seismological network said. Todays quake originated close to the epicentre of Tuesdays quake, the reports said, adding that most of the damage was also reported from the same mountainous region of central Taiwan. The shockwave causing landslide killed two persons, a man and a woman on a road linking Nantou county with Yunlin county to the south, the local radio in Taiwan said. Two more deaths were reported from other towns in Nantou. 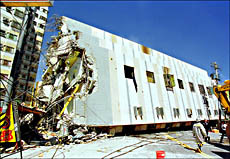 Several buildings had also collapsed, the radio added. Some 15 persons were reported injured in the latest jolt which forced people to come out of their homes to safety in the open. The quake left numerous landslides across the country and forced the suspension of ongoing rescue and reconstruction operations. Local television showed a 12-storey damaged apartment block collapsed on a road in Nantou city and neighbouring building in flames. It was not known whether anyone was inside. The 40 flats were evacuated after last Tuesdays quake measuring 7.6 on the Richter scale that killed at least 2,100 persons and caused extensive damage. Meanwhile, rescuers pulled out two brothers alive from a 12-storey building in downtown Taipei that had collapsed in the first quake. TAIPEI, Sept 26 (AFP)  Two brothers who lived for 130 hours under rubble from Taiwans earthquake survived by eating rotten apples and drinking urine, doctors said today, although their parents insisted Buddha saved them. "I would say this was a miracle," admitted Kuo Jung-an, director of the military Sunshan Hospital, after Sun Chi-kuang, (20), walked out alive and his brother, Chi-feng, (25), was pulled out by rescuers. Apart from dehydration, smoke inhalation and lower than normal body temperatures and blood pressure, the pair was unharmed. Sun Chi-kuang apparently dug his own way towards light made by approaching rescuers and crawled out to announce his presence. His brother was pulled out shortly afterwards. According to doctors, the pair at first lived on three bottles of mineral water and four rotten apples stored in a refrigerator buried with them in the ruins of their Taipei flat. Taipei Mayor Ma Ying-jeou said the pair told him they had to drank their own urine. "The patients said they began to drink water seeping into the rubble after they finished drinking the mineral water," Kuo said, referring to water sprayed by firemen to extinguish fires in the collapsed building. He said the brothers had been protected from tonnes of concrete and metal by the damaged refrigerator and a desk. CAIRO, Sept 26 (Reuters)  Egyptians went to the polls today in a largely ritualistic vote to confirm President Hosni Mubarak, the only candidate, in office for another six years. State television showed Mr Mubarak, his wife Suzanne and two sons Alaa and Gamal casting their ballot at a girls school near their home in the Cairo suburb of Misr El-Gedida. A crowd outside chanted "with our soul and blood we sacrifice for you, Mubarak" as the Presidents motorcade of black limousines drove away amid tight security. Egypts 41,000 polling stations opened at 8 a.m. Local time and were due to close at 5 p.m. Local time. Train services were free for the day to help the countrys 24 million voters reach the polls. Trucks full of khaki-uniformed riot police armed with rifles and batons appeared in the already heavily policed streets of Cairo, though voting was expected to be peaceful. Mr Mubarak (71) was unopposed, as in all previous elections since he took power after Muslim militants assassinated President Anwar Sadat in October 1981. Mr Mubarak urged Egyptians, most of whom are too young to remember any other leader, to grant him a fourth six-year term. "This is not so much a referendum on my person as on the path of our nation." He said in a televised speech. "I call on all of you, supporters and opponents, to go to the polls and play a role in your countrys politics." He said the government led by Prime Minister Kamal Ganzouri would resign after the referendum, but would stay on until a new one is formed. Interior Minister Habib el-Adli is expected to announce the referendum results at noon (0900 gmt) tomorrow. DUSHANBE: Over half of Tajikistans electorate had voted by midday in todays key constitutional referendum which could extend the Presidents term and allow the Opposition to set up Islamic political parties. Many in the war-scarred central Asian state of six million people are hoping the compromise package will bolster a shaky peace pact between the Moscow-backed secular government and Islamic opposition, which fought a civil war from 1992 to 1997. The central election commission said 58 per cent of around 2.9 million eligible voters had cast their ballots by noon (0700 gmt), with eight hours voting still to come. With the 50 per cent minimum turnout already passed, the results of the referendum will stand. Proposed amendments will be adopted if more than half of those who vote support them. Preliminary results will be known tonight or tomorrow morning. Both the government and Islamic United Tajik Opposition (UTO) movement agreed on the proposed changes, which are widely expected to be approved. Voters are asked in a single question to approve or reject the package of amendments in its entirety. President Imomali Rakhmonov, who was elected in 1994, could run again for the leadership in Novembers presidential poll as he would be doing so under a new constitution. ISLAMABAD, Sept 26 (PTI)  Despite the earlier assertion that it would take a final decision about crossing the Line of Control (LoC) next week, the Amanullah Khan-led Jammu and Kashmir Liberation Front (JKLF) has started mobilising support urging people in Pakistan-occupied Kashmir (PoK) to take part in it. The group today urged students and youths in PoK to take part in the LoC crossing on October 4 "in large numbers to express their resentment on the move to make it a permanent border between India and Pakistan", a statement issued here said. Jammu and Kashmir Students Liberation Front President Jamshed Mirza has also announced his support to the LoC crossing and said thousands of its activists would take part in it while another faction of the body has also expressed its support to the decision. A JKLF spokesman, when reminded about an earlier statement that the front would take a final decision on the appeal of the Pakistan Government to refrain from the crossing, told PTI, "Yes, our central executive committee is meeting on September 30 to take a final decision but we are certain that our conditions will not be accepted and hence our decision to cross the LoC will stand". The JKLF wants international mediation to resolve the Kashmir issue based on uniting both parts of Kashmir and creating a Kashmiri nation, he said elaborating the conditions put by the group to call off the crossing. DUBAI, Sept 26 (UNI)  Yemeni President Abdullah Saleh was re-elected with a landslide victory in the first direct presidential election in the country. Yemen Electoral Commission announced late last night in Sanaa that Mr Saleh polled 96.3 per cent of the votes while his lone rival, Mr Najib Qahtan Al Shaabi, could manage just 3.7 per cent of the votes. Nearly 66 per cent of about 5.6 million voters in the Arab state exercised their franchise in Thursdays election, media reports said. Both Mr Saleh and Mr Al Shaabi belonged to the General Peoples Congress (GPC) Party. Their candidatures were first approved by the 301-member Parliament where the GPC has 226 seats. ISLAMABAD, Sept 26 (PTI)  Pakistani opposition leaders have rejected talks offer by Prime Minister Nawaz Sharif, terming it as a ploy to divide their alliance as well as to give his government a new lease of life in the wake of nationwide anti-government movement by their parties. "Time for talks is over and now the matter will be decided in the battlefield," Mr Asfandyar Wali, chief of the Awami National Party (ANP) and prominent Pathan leader, said yesterday, referring to Mr Sharifs offer. Mr Wali, son of Khan Abdul Wali Khan, told a public meeting at the north west frontier province town of Kohat that the protest move against the government would go on and rejected the offer for talks. He said the offer was aimed at giving the government a new lease of life and said that his party would continue its movement against a "particular circle which considered Lahore as Pakistan  a dangerous trend and a conspiracy to dismember the country". Mr Ghulam Mustafa Khar, a noted Punjabi leader of the Pakistan Peoples Party (PPP), alleged that Mr Sharifs offer for talks was aimed at dividing the opposition parties and urged that even if such talks were held all these parties should go together and insist on the Prime Ministers resignation and holding of fresh elections. "Instead of entering into individual talks with the government, all opposition parties should hold joint talks with Mr Sharif and the latter must assure of going for fresh poll within six months," he said. Hard-liner Jamaat-e-Islami had also rejected the talks offer dubbing it a ploy to betray the nation. Meanwhile, the Inter-Services Intelligence (ISI) chief, Lieut Gen K. Ziauddin, has told the US Congressional Intelligence Committee that Pakistan needs support to check radical religious elements and warned it of the dangers of rising religious extremism in his country. ISLAMABAD, Sept 26 (UNI)  A Pakistan occupied Kashmir (PoK) Urdu journal has claimed that Islamic militants are in a position to use poisonous gases and chemical weapons in Kashmir, thus strengthening the suspicion of the Indian Army that they have already tried them during the Kargil invasion. The "Jehad-e-Kashmir" of Muzaffarabad, quoting unnamed sources among militants claimed that they were in a position to produce poisonous gas which could suffocate one to death. The journal adds that an American who converted to Islam and has joined ranks in Kashmir is the brain behind the "invention". It may be mentioned that the Indian Army had found some gas masks in the vacated posts of the retreating Pakistan Army regulars and the militants from the icy heights of Kargil in July, raising suspicion of Pakistan Army personnel being armed with chemical weapons. Talking to the reporter of the journal, The American, now christianed Abdul Masur, said he could produce such "poisonous gas bombs" on a large scale from certain plants he discovered on the heights of Kashmir. With this, the threat of poisoning the Indian Armys food and water has become more pronounced, the report says, adding that the ISI is already into ways and means to spread "dangerous diseases" in the Army camps. ISLAMABAD, Sept 26 (PTI)  Pakistani opposition leaders, led by former Primer Benazir Bhutto, today slammed the Nawaz Sharif government for another crackdown on a proposed opposition rally in Karachi terming it signs of panic while describing Sharif as a "petty tyrant". "The regime unnerved by the demonstration of public anger-resorted to mass arrest, house searches, detentions and brutal use of police force to thwart the rally," Benazir in a statement released by her party here, said. The regime has once again resorted to use of brute force to suppress democracy," she said, adding "if dictators like Ayub, Yahya and Zia could not stand the wrath of the people, who is this petty tyrant" in an obvious reference to Premier Sharif. Thousands of opposition workers and leaders were arrested as the police and security forces blocked all roads leading to the proposed site of the rally and even baton-charged small opposition rallies trying to make their way to the venue. Adviser to Prime Minister on Sindh Affairs Ghaus Ali Shah, who is acting as the de facto Chief Minister of the province, ruled out the possibility of the release of all detained opposition leaders and workers saying that they could only be released by the courts. Ms Benazir in her statement also urged the international community to condemn the "heinous and bloody regime" and said it would be criminal if the world remained silent spectator to, "Sharif's anti-democracy steps". The Pakistan People's Party (PPP) President further said that Sharif was leading the country towards destruction and the people of Pakistan would under no circumstances, let him fulfil his agenda and added, "I wish to state categorically that the people's demand for a just and competent governance will not be stamped out by the petty tyrant". The PPP, meanwhile, is observing a protest day today in the entire Sindh province against the arrest of its leaders and workers and demanded immediate release of all those taken into custody. The PPP claimed that 64 of its leaders had been arrested in yesterday's crackdown while Mohajir party the Muttahida Qaumi Movement (MQM) also said that most of its front-ranking leaders had also been put behind the bar following action against opposition parties. The PPP and other opposition parties have declared to continue their protest even tomorrow if their leaders were not released. CAIRO, Sept 26 (PTI)  An Indian maid has been arrested here on charges of murdering her employer, local media reported today. Tajmani, 35, allegedly hit her employer, a contractor's wife, with a hammer after the latter refused to let her travel to India to meet her three children, Al Gomhuria newspaper reported. News reports said after killing her employer, the maid set the apartment afire. Tajmani, hailing from Andhra Pradesh, had been working with the contractor's family for one year and reportedly confessed to the murder of her employer. She had initially told the police that a short circuit triggered the fire that killed her employer. However, a week after the incident the police investigating the case found out that Tajmani had killed the lady and set the house afire. GROZNY (Russia), Sept 26 (Reuters)  Russian warplanes today bombed a southern area of the Chechen capital Grozny, where according to locals an oil refinery is located, an eyewitness said. Explosions could be heard in a southern part of the town and the sound of two jets roaring overhead. Russian warplanes have swarmed over Chechnya for the past three days, intensifying attacks to root out what they say are Islamic "terrorists" sheltering in the breakaway republic. An eyewitness said warplanes bombed the capital in the morning but that it was not clear how much damage had been done. Russian officials could not immediately confirm the report but said warplanes had made raids in the past 24 hours. Russian officials have said air raids, now in their fourth day, would be pursued until they have destroyed the fighters, their bases and sites in Chechnya. BETHESDA (USA), Sept 26 (Reuters)  Doctors have asked US President Bill Clinton to rest his voice for 10 days to ease chronic irritation of his vocal cords, following a physical examination that found him in excellent health despite gaining 8.1 kg. The 53-year-old President underwent five hours of poking and probing by a battery of doctors at Bethesda Naval Hospital, near Washington, yesterday. Besides the throat problem, they found him still troubled by stomach acid. They used liquid nitrogen to freeze and remove two small precancerous growths called "actinic keratoses" over his right eye. "I believe the President is in outstanding condition, said cardiologist Richard Morrissey, who oversaw a treadmill test that found Mr Clinton able to reach a maximum heart rate of 90 per cent, considered excellent for a man of his age. Mr Clinton has been hoarse for about two weeks, ever since his 20-hour flight from Washington to New Zealand for an Asia-Pacific summit. Talking has only made it worse and the President has been unable for the most part to cut back on his extensive schedule of speechmaking. Mr Clintons long-time ear, nose and throat doctor from Arkansas, James Suen, said Mr Clintons throat problem was a result of "talking too much plus the irritating effect of stomach acid bubbling up into his throat  a disorder known as gastroesophageal reflux. KABUL, Sept 26 (AFP)  Afghanistans opposition forces today conceded that the Taliban had made some advances after the hardline Islamic militia launched the second wave of its summer offensive. Gen Sayed Hussain Anwari of the Oppositions United Front said several posts were captured around Imam Sahib in northern Kunduz province where heavy fighting had entered the second day. "We think they will continue their attacks in order to make up for their defeat in the Shamali areas. We believe they will be defeated in this region too," Mr Anwari told AFP. The Taliban launched the summer offensive on July 28 at frontlines north of Kabul.